Malaysia Prime Minister and Barisan Nasional party president Najib Razak (centre) delivers his speech during a campaign at his constituency Pekan, on May 8, 2018. KUALA LUMPUR - As campaigning for Malaysia's election drew to a close, pollster Merdeka Center predicted on Tuesday (May 8) evening that ruling coalition Barisan Nasional (BN) would be returned to power by retaining the support of Malay voters, yet possibly lose the majority vote. This would leave it in the same position as it was after the previous election. BN is expected to safely win 100 out of the 222 federal parliamentary seats, while its main challenger, the Pakatan Harapan (PH) coalition, will likely bag 83, said Merdeka Center. Islamist Parti Islam SeMalaysia (PAS), which has a stronghold in Kelantan, is expected to comfortably hold on to just two seats. Far closer contests are expected in the remaining 37 seats. "The high number of marginal seats implies that voter turnout will be a critical factor in determining the outcome of many seats on election day," Merdeka Center said. In terms of the popular vote within peninsular Malaysia, PH is expected to pip BN to the post by winning 43.4 per cent, compared to BN's 37.3 per cent, according to estimates based on the Merdeka Center survey that was concluded at noon on Tuesday. PAS is expected to win 19.3 per cent of votes. Voters, the report showed, were largely concerned about economic resilience and the protection of their rights more than having a clean government. With the BN's "retention of a plurality of support among Malay voters, alongside PAS' ability to retain at least one quarter of the Malay vote share," BN is expected to win the election, said Merdeka Center. Earlier on Tuesday, another Kuala Lumpur-based research firm, Ilham Centre, said that longtime BN bastion Johor may fall to PH, which is expected to maintain control over Selangor and Penang. BN, according to Ilham Centre's executive director Hisommudin Bakar, is expected to keep the states of Terengganu, Perlis, and Pahang and possibly win Kelantan back from PAS, which has held it since 1990. He sees BN in a tough fight with PH in Kedah and Perak. Malaysia's federal parliament has 222 seats, of which BN held 131 seats - 17 short of the supermajority needed to amend the Constitution. Malaysia' electoral boundaries were redrawn this year (2018) in a manner which the opposition slammed for favouring BN. But Mr Hisommudin said that the redelineation "was unable to add seats that can contribute to a two-thirds majority for the ruling party". His centre found PH in the lead in 77 of the 165 seats on the Peninsula, with BN in the lead in 56 and PAS ahead in seven. The remaining 25 will see close contests. 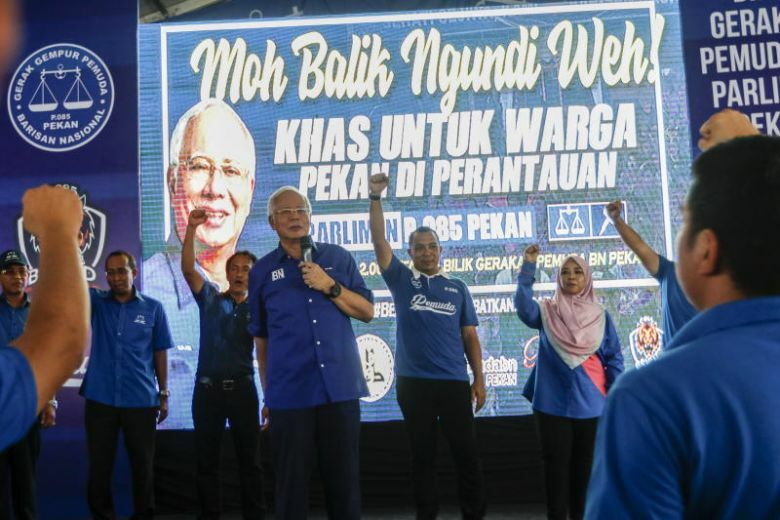 BN leader and prime minister Najib Razak wrote in a blog on Monday that the opposition was scaremongering and making "false promises they know they cannot fulfil". The PH's presidential council released a statement on Tuesday alleging that "irresponsible fiscal policy conduct since 2009, and steady erosion of the quality of our institutions have set the country back". It pledged to evaluate the national financial position within 100 days of taking over, saying: "Respected, eminent, patriotic Malaysians will be invited to contribute in undertaking these reforms."